Feeling overwhelmed by the mere thought of writing your dissertation or scholarly project? Wondering how to begin and where to find the time? You are not alone. Earning your advanced degree is an extraordinary accomplishment, but completing those final stages can be a daunting task. A Nurse’s Step By-Step Guide to Writing a Dissertation or Scholarly Project, Second Edition, is a straightforward how-to guide. This book is intentionally concise because, let’s be honest, the last thing a busy candidate needs is another unwieldy, doorstop-sized book. 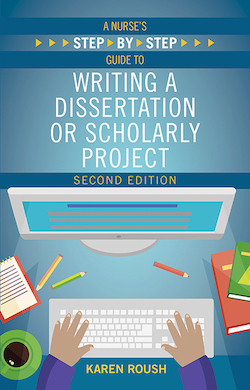 Packed with practical steps and tools, this fully updated second edition—which includes a new chapter on the various formats for manuscript dissertations— will help you plan, document, organize, and write your dissertation or scholarly project. Don’t go it alone; let author and fellow dissertation survivor Karen Roush help you get from square one to DONE.